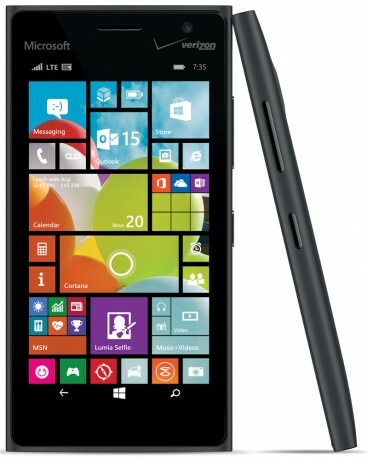 Verizon Wireless today announced the Microsoft Lumia 735, a low-cost Windows Phone. The 735 includes a 4.7-inch HD screen, 1.2GHz quad-core processor, and 16 GB of storage. The main camera has a 6.7-megapixel sensor and the user-facing camera has a 5-megapixel sensor. The phone supports memory cards up to 128 GB and includes a 2,220mAh battery. In addition to Windows Phone 8.1 with Cortana and the Lumia Denim update, the Lumia 735 offers owners a free year-long subscription to Office 365 as well as 1 TB of OneDrive cloud storage. The Lumia costs $192 at full retail or $8 per month for 24 months with a Verizon Edge plan. It is available online today, but won't reach stores until July. Verizon also is offering $100 bill credit to customers who port their number.